Recently I've been to a fair number of Thai restaurants around KL, and I must say, there's a rather huge number of people who love Thai food. Samira Thai Restaurant by Asian Terrace is another fine Thai establishment located inside Sentul Park KL just beside the KL Performing Arts Centre (KLPAC). Now the first thing that caught my eye when I went there was that the environment was truly beautiful. Walking around outside the restaurant was an experience in itself, as I could truly enjoy the scenic greenery. It reminded me so much of this Japanese movie that I watched, complete with the fishes in the pond and all. I was told the previous restaurant here was a japanese restaurant, and that Samira took it up not too long ago. The atmosphere was truly a romantic one, perfect to bring your other half over for a candle lit dinner facing the lake while having a good Thai meal. In fact I walked a couple of rounds around the restaurant to truly soak in the view. 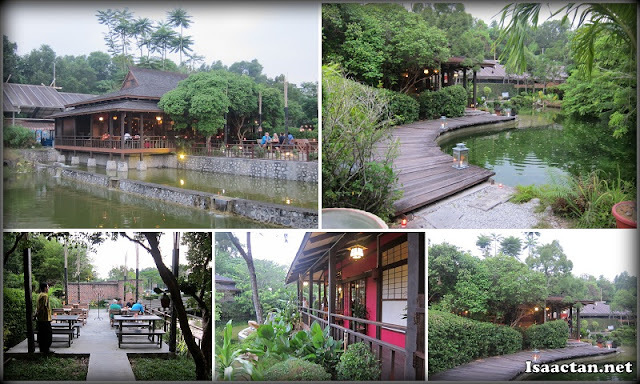 Anyway do check out below on what we had that wonderful evening at Samira Thai Sentul Park. We kicked off with some appetizers, and the Spicy Seafood and Pomelo Salad was truly unique, at least for me. Instead of the usual vegetables, pomelos were used, and the juciness of the pomelos couple with the sour lime taste, the dish was a good opener for more Thai Restaurant food to come. When the Vietnamese Yam Salad was brought out, I was impressed with the structure and taste of the thin crispy yam. It was crispy and went well with the sweet and sour sauce from the topping. I was told this dish was something new that Samira incorporated into their menu, which wasn't really of Thai origin. As with any Thai dining, I'm always on the lookout for their otak-otak. Personally, I'm not even sure if its Thai as I used to enjoy it when I was young in my hometown Penang. The Grilled Fish Fillet in Banana Leaf at Samira was the one I'm used to, the mushy and soft type. Squeeze some lime over it, you can even enjoy this dish on its own. If you're a squid lover, then this dish may just fit in right up your alley, as the Steamed Squid with Chili and Lime Juice served here were so clean cut, white and fresh that I had more of my fair share. The squids here were steamed together with some really spicy chilli to bring out the tangy taste. The flesh was chewy enough too, not overcooked at all. Being a poultry lover, I appreciate good fried chicken, and the Spicy Chicken with Chef's special sauce here was cooked just the way I like it. Huge tender thigh deep fried to perfection, doused in spicy sweet and tangy sauce, it does remind me of something my mum would have made at home. Not a fan of salmon, but the one here, the Grilled Norwegian Salmon with basil leaves was pretty unique. It looked way messier than it tasted. Cooked with aromatic basil leaves, chili, and shrimp paste, the taste may not be everyone's cup of tea, but special though. More Thai seafood dishes ensued, most table was Samira's River Prawn with Lemongrass Sauce. Deep fried, the rather huge prawns were doused in lemongrass sauce which actually seeped inside to the meat itself. The dish itself was really tasty, especially since the prawns were fresh enough. The curry dishes came next, namely the signature Traditional Thai Thick Tom Yam with Seafood and the Thai Massaman Curry with Beefboth which tasted equally good. I liked the thick tom yam soup though, as it had that authentic Thai spicy tomyam flavour to it. Throw in lots of seafood, prawns, squids and it goes really well with a bowl of white rice. Have you tried this dish before? Personally this was my first time having the Crispy Catfish with Mango Salad dish. The catfish actually tasted like deep fried floss, and was truly a unique dish for me. It had a mild fish flavour, mostly I could only taste the crispiness, as the texture was so light, melting in the mouth. Another Thai specialty dish would be the Phad Thai Noodle with Prawn and Eggs. Similar to fried kuey teow, but yet very much different. I've had a few Phad Thai dishes recently, some are good, some not so, but the one here at Samira had just the right amound of sourness and elasticness to the noodles. I haven't actually tried the original ones in Thailand before, so I wouldn't exactly how it should taste, but based on some of my friend's feedback, this was good. Initially not in the menu, I had the Pineapple Fried Rice ordered as I wanted to try out how Samira prepared this dish. Cooked with lots of pineapples, and spices akin to kunyit, the yellow colour of the rice looks as good as it tasted. I would have preferred if they had added in more cashew nuts though. We ended the meal with the mandatory Mango Sticky Rice and Samira's specialty the Pan Fried Banana with Ice Cream. Both were sweet desserts, sweet enough to satisfy our already bulging stomachs after all the heavy food. But as they all say, we always have a special compartment for desserts in our stomachs. 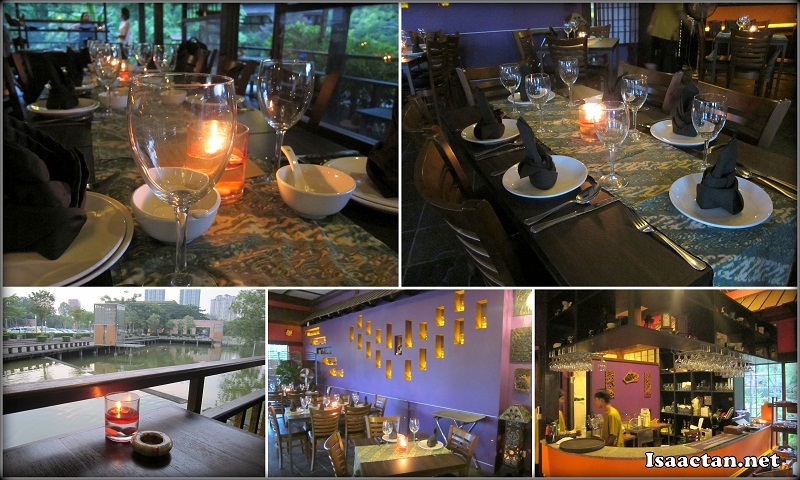 Do check out this hidden gem of a restaurant, Samira by Asian Terrace in Sentul Park next to KLPAC should you be in the vicinity. Oh? You were invited too? Saw this in somebody's blog...yesterday, I think! Last time I was there, it was Japanese, if I remember correctly. Not going to comment on it AGAIN - will end up saying the same things. I love Thai food. This looks like one to check out though. The food looks very good.. but the price is the best! lol..